where we are soaring to success! The mission of the Reidville Elementary School media center is to teach students to be effective users of information and technology, encourage them to be critical thinkers and prepare them to be life-long learners. The media center is open Monday through Friday from 7:15 to 7:40 for checkouts before school. Then, from 8:00 to 3:00. The media center will operate on a fixed/flexible schedule this year, allowing students, teachers and parents access to media center resources and the media specialist throughout the day. Students in kindergarten through second grade have a fixed media center time. Third and fourth grade students, either individually or in small groups, may come daily to check out books, read or do research. 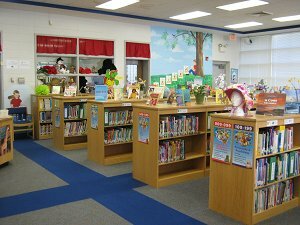 Third and fourth grade teachers may schedule time in the media center for research or other use of the media center resources when it fits into the teachers' lessons and may schedule more than one day at a time. Students, parents, and teachers can browse our school media center catalog anytime, anywhere.Click here to perform searches by title, author, subject, keyword, or series.